Not much gaming activity this week. I am currently laid up with my arthritic spine, meaning standing up straight, walking and frankly doing anything is not much fun. I write this through a haze of MST and Oramorph solution so I trust it'll make sense. The last game we played saw Robbie and John return for another go at Impetus Baroque. I asked if I could be the French as I do like them rather a lot. 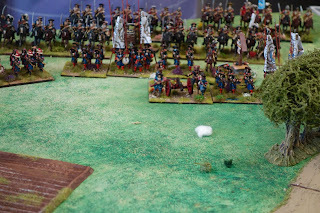 I hadn't banked on the dice rolls for sides resulting in me being on my own facing the other two with the combined Dutch/Spanish/Imperial force. Not only that but I was of course in charge of refreshments and lunch, which actually proved quite handy as it meant I had the occasional breather from the game. The 'sides' were the same as last time, with the cavalry rearranged into units of three stands to match the frontage of the infantry units. This of course gave us a couple more mounted units for each side, but slightly more for the Allies. It was a simple encounter battle with the single objective of breaking the enemy. Robbie supping his tea while the armies start to close on each other. Spanish dragoons holding the orchard, which they did for much of the battle. The French left wing horse slowly advancing on the Allied right. Too slowly on reflection. The Dutch foorguards, supported by artillery with a brigade of horse to the rear, advancing in the centre. My right flank facing a strong infantry force supported by artillery and rather more horse than I was comfortable about dealing with. On move one this entire command became disordered after attempting to move as quickly as possible towards the town area. Thankfully they were safe from any interference by the enemy. The advance of the Dutch footguards is stopped in its tracks by concentrated artillery and musket fire. 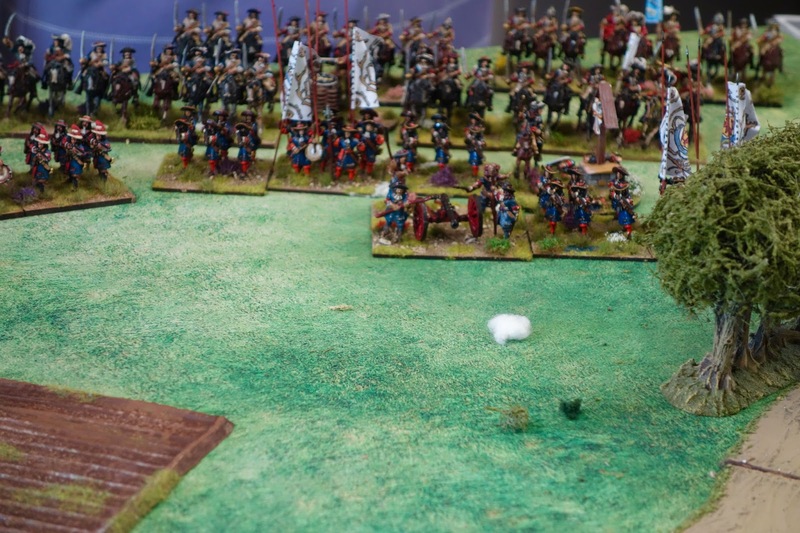 The leading battalion is eventually so damaged that John chose to withdraw it from the battle, his preventing me from claiming the maximum victory points for destroying the unit. 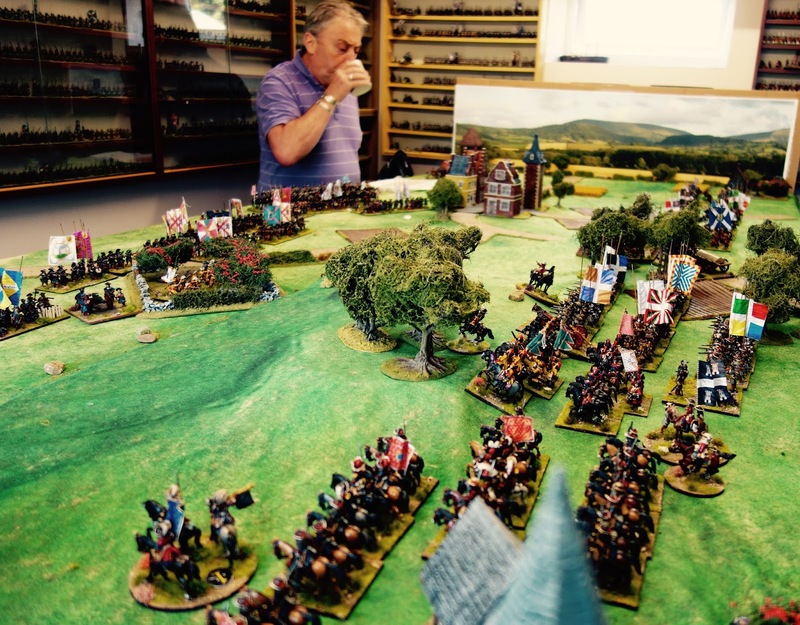 Imperial cuirassiers and the Maison du Roi clash on my right flank. The Dutch holding the hedgerows to the right of the town. On my left, I finally got my dragoons to move (their commander was poor but an unlucky double '1' resulted in him being downgraded to s**t for the rest of the game). My plan was to shield my horse and try and soften up the Dutch foot before charging with my horse. Great plan. Nearly worked too. 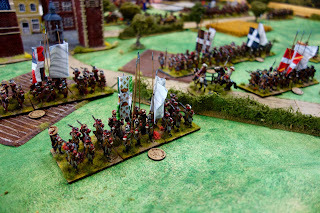 The Dutch footguards an instant before they were withdrawn. They left a nice gap in the line. On the left my horse charged the Dutch and in a succession of waves managed to break one unit, albeit at some loss to ourselves. 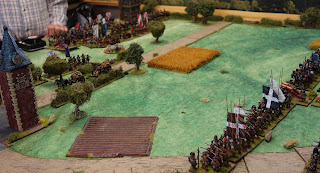 In the centre my infantry assaulted the orchard and drove the Spanish dragoons off after a hard fight. The French left showing their horse (the Cuirassiers du Roi and La Reine) charging into the disrupted Dutch line. My dragoons were successful in pinning down part of the Dutch line but were eventually destroyed. The French C-in-C ponders. What to do now? Our left is crushed, the centre is advancing with superior numbers and the right has made some gains, but at great loss. A Scots regiment in French service closing on the Spanish in the Allied centre. The French second line included the Gardes Francais (in grey to the right) and the Gardes Suisse. Both were fresh units. The Dutch left crosses the hedgerows to exploit my outflanked units. 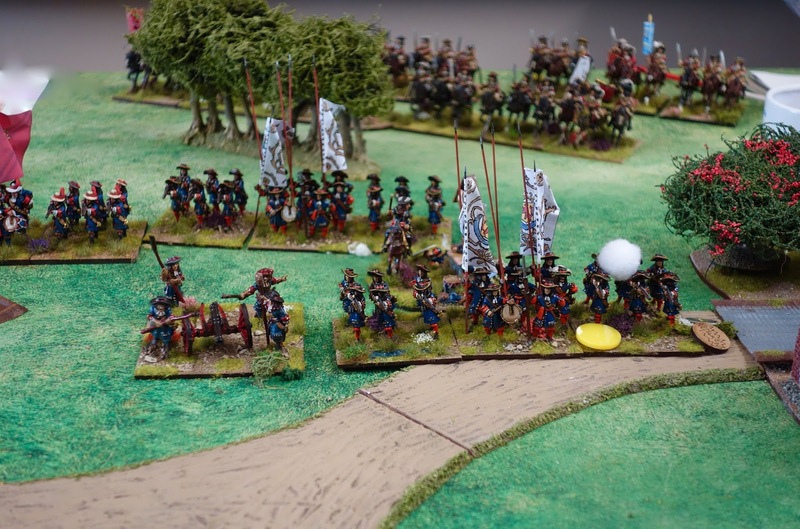 Imperial cuirassiers charging into my exposed right flank. Above and below are two 'arty farty' shots using one of the facilities on my new camera (I blame my photographic genius Brother-in-Law for this impulse buy). It does lots of stuff and is as yet not fully explored. The end of the battle. The Spanish in the centre are being driven in, but will the French succeed in the centre and on their left flank before the Dutch sweep round on their exposed right flank? We will never know. The consensus was that it was a draw. An excellent game and I have now just about got the hang of the rules and am warming to them rapidly. You really have to think carefully and plan your moves. Much more cerebral than Pike and Shot (which I still like). Deployment is key and get it wrong at your peril. I really like the command and move sequences, together with the option for the enemy to react to certain of your moves/actions. Anyway, good rules. Go out and buy them. Excellent game too. I will now of course have to rearrange my armies to cit in with Baroque, but apart from the some jiggling of cavalry units that won't be a problem. No game this week for the reasons stated. In the meantime I am planning for another game using Baroque next Tuesday before going back to the WAS/SYW. Just got Impetus myslef and want to try it with some 1689 games. 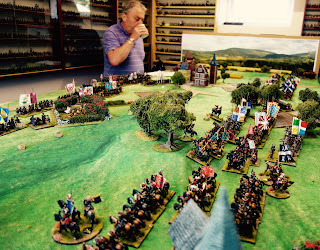 Love your basing convention too, pike/shot sleeve design works well in those pics - and an epic game. It was a tense game Colin, I think we are getting to grip with the rules now, I hope anyway. Sorry to hear about the arthritis, Colin, I can sympathise. A fine looking game in a period I've never even dabbled in! Fantastic looking game Colin. Hope you are feeling much better soon.